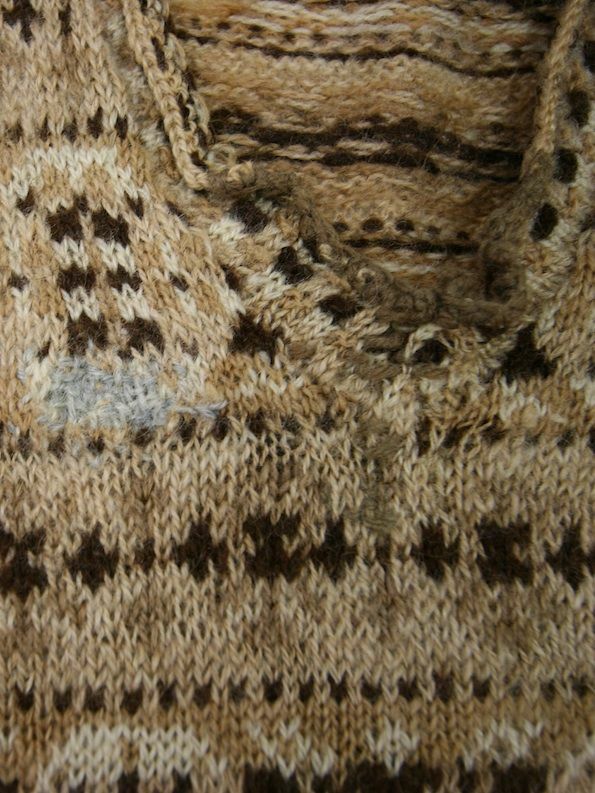 My vintage-obsessed knitting comrade Susan Crawford embarked on an exciting project about three years ago: she has taken 25 20th century knitted pieces from the textile collection of the Shetland Museum and Archive and turned them into 21st century knitting patterns. In order to fund the costs of making the book, Susan started a Slushpub fundraiser, which has already well exceeded her initial target! The additional money will go to more of the photoshoot costs, a second photographer to take ‘behind the scenes’ footage of the photoshoot to enhance the book further, additional research to make the book even better, and image licencing to increase the number of historical images included in the book. This short-sleeved jumper appealed to me because of the unusual design, which combines a classic “all-over” with stripes and a border of diamonds. All the diagonal lines really pull the design together. This is such a classic cardigan! 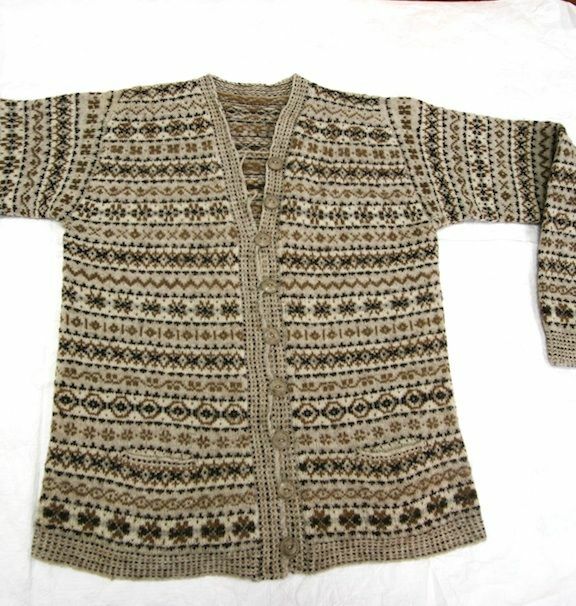 It’s possibly one of the most typical Shetland knits in the collection, but I love the quiet elegance and the large collection of peerie patterns, punctuated by the recurring diamond pattern. How could I not like a pair of knee-high socks with some darning? Against better judgment I once knitted a pair of socks from woollen spun Shetland wool. I wore holes in them after only a few wears, and they’ve been in my mending basket for almost two years now. 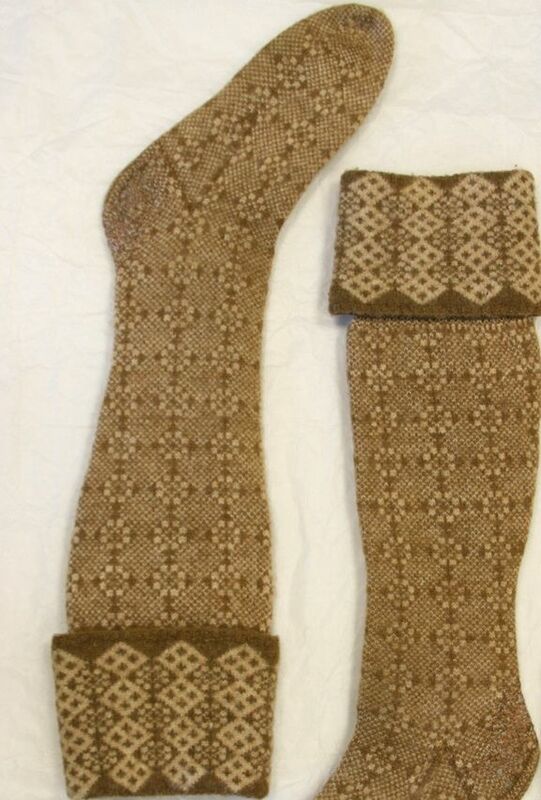 I wonder whether these golf stockings were knitted from a worsted-spun yarn instead. But in the end, the garment I wanted to knit most, was the “Prisoner of War” jumper. 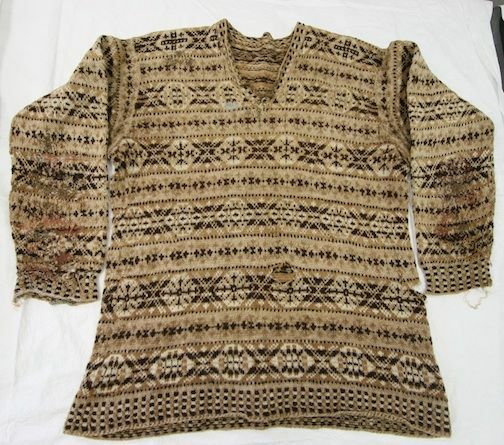 When I attended Shetland Wool Week in 2013, this jumper was on display in the Shetland Museum. I had already seen pictures of it from Susan, but that didn’t quite prepare me for the impact of seeing the real deal. 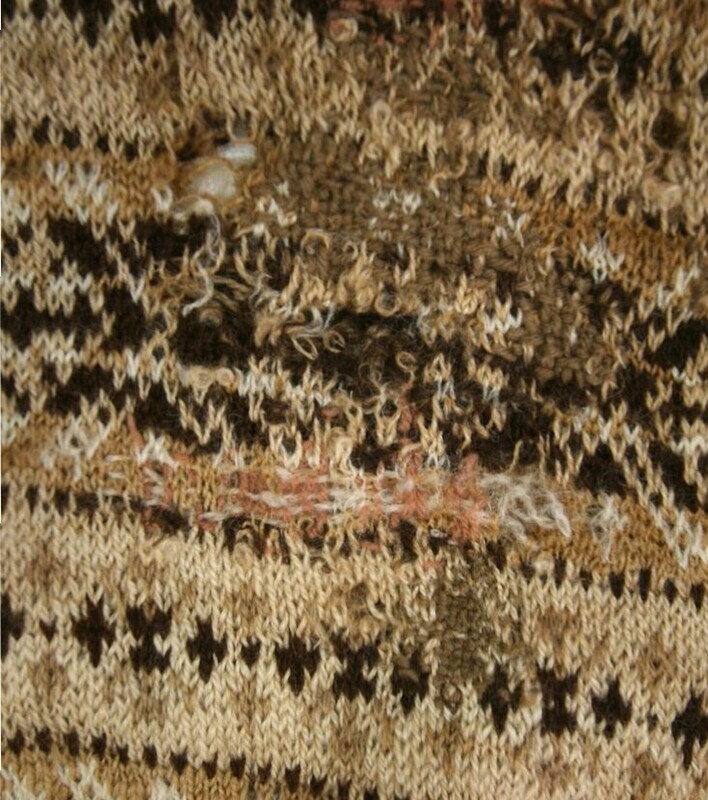 It’s knitted from fine wool, and as you can see, it’s been mended a lot, and being able to see it failry up-close was a humbling experience. 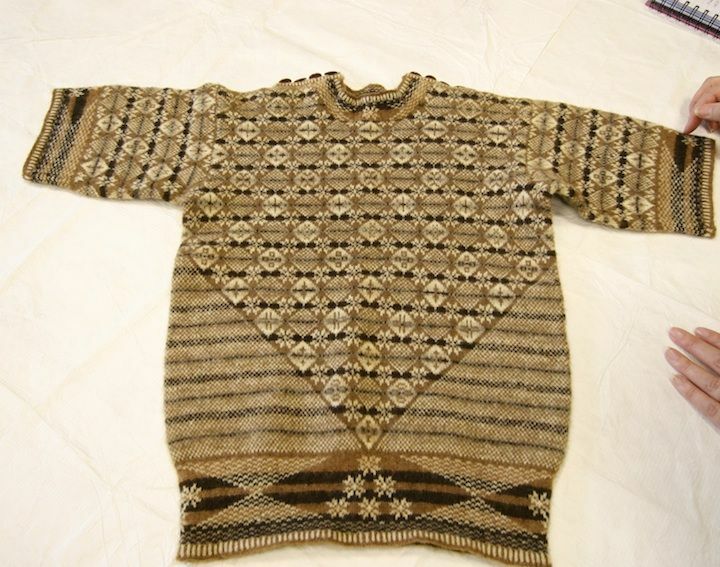 This jumper was knitted for Ralph Paterson by his wife. He was wearing it when he was taken prisoner of war in Hong Kong. It brought him comfort, and reminded him of home. It must’ve been very precious to him, as it has been mended in many places, using odds and ends of yarn. 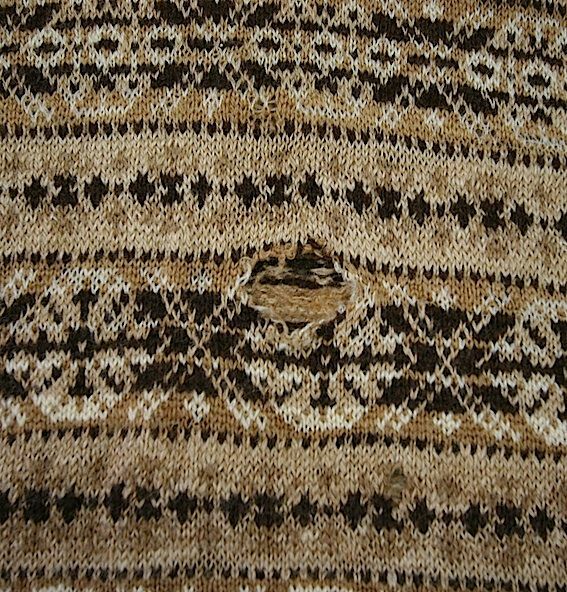 Not all holes were darned on this jumper; perhaps Ralph Paterson might’ve been on his way home again when he discovered this hole? I’m looking forward to seeing Susan’s book, and you can probably guess which pattern I’m itching to cast on! All pieces – each with their own unique story to tell – have been developed into comprehensive multi-sized knitting patterns, complete with instructions, technical advice and illustrated with colour photography shot in Shetland. 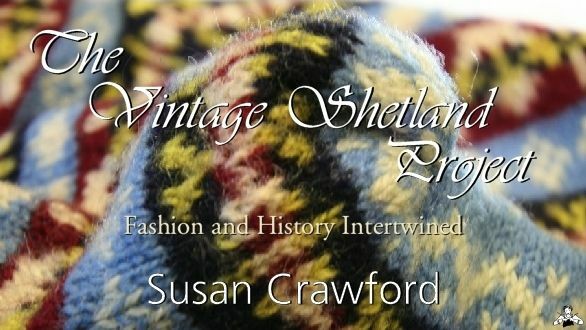 With an introduction reflecting on the story of each hand-knit item this book is a treasury of Shetland knitting patterns and an insight into Shetland’s rich textile traditions. The blog tour continues with Kate Atherley‘s blog on Wednesday, 29 July. Beautiful! How can I order the book? You can pre-order it through the Slushpub campaign. Follow the link in my blog post and it’ll take you there. What a beautiful project and I love the way it’s creating ac immunity – which is also very much in keeping with the original Shetland approach! I’m particularly moved by the story of the “Prisoner of War” jumper; it gives the whole garment an added dimension. Thanks for sharing! I will buy the book though 🙂 YES! !